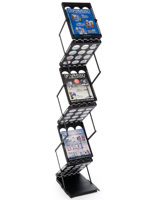 This catalog rack is ideal for any large event, and is easy to take on location. 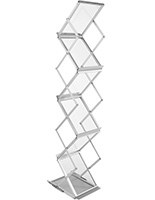 This literature display or portable magazine holder, can be easily set up and taken down with its "accordion-like" design. 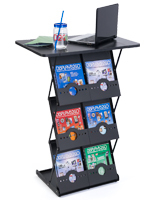 The catalog rack snaps into any of the adjustable height levels with ease. To secure the catalog rack at a desired height, simply pull up on the top frame of the magazine display rack and lock it into place. 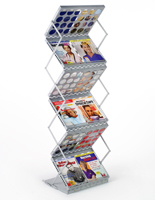 The magazine display holder, catalog rack is ideal for displaying a variety of literature, such as magazines, brochures, small posters, and catalogs. 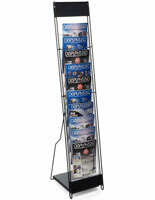 This literature stand, adds professionalism to trade show booths or in any business atmosphere. 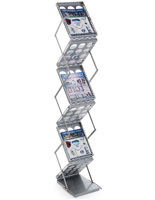 The magazine holder, catalog rack features 5 pockets, each measuring 18-5/8" w x 12-7/8" h. As a result, the display can hold multiple stacks of information in each pocket, allowing a wide assortment of literature to be displayed all at once. 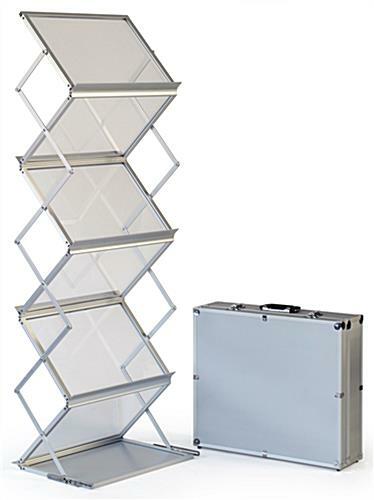 The catalog rack that collaspses comes with its own "silver" finished carrying case, made from hard-backed styrene. The carrying case also features a foam-lined interior. This catalog rack case keeps the literature display snugly. It is unlikely that the rack will be damaged during transport. 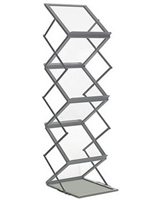 This catalog rack is made from aluminum, and its pockets are made with strong, clear-plastic inserts. 18.6" x 12.9" x 0.75"
17.1" x 13.0" x 9.0"
We purchased two of these and were pleasantly surprised at how nice they looked! They were super easy to set up and take down. 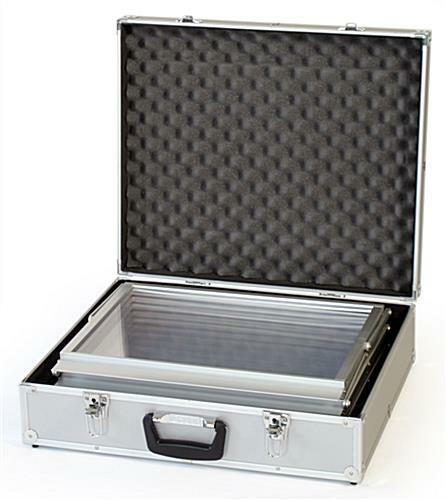 The cases they come in are sturdy so we're not worried about damage to the racks in transport. We had a lot of great comments from the publishers. Oh, these look great Jim! Thanks so much for sharing your awesome picture of these literature racks! They're super professional! The rack is great and is preferred by our booth staff. My only complaint is about the case; it's not heavy duty enough to survive UPS shipping. One time shipping resulted in battered case returned; after 2-3 times shipping, it came back with the edge trim partially ripped off and bent at 90 degree angle. Had to trash it and get a Pelican case to fit the rack. Wish it had retractable handle and wheels. I really, really love the general look and the high quality. However, the travel box arrived with a dent. Not a huge deal but bummed me a tad. Thank you for your feedback, JoAnn. Please reach out to us if we can assist you with the dented travel box. Thank you!